Announcement Welcome to Mack & Jane! I’m so happy to be back on Etsy! After opening in 2012, then taking a few years away from Etsy to pursue a wholesale business, I recently returned to my Etsy roots. So, I’m back in my happy place, designing and creating necklaces, bracelets and earrings in my Pennsylvania studio. I love a mix of styles as you'll see-- some minimalist and sleek, some a little boho, each one unique. Enjoy browsing -- I hope you find that perfect piece of jewelry — a present for mom, a gift for a special friend, or a treat for yourself! Welcome to Mack & Jane! I’m so happy to be back on Etsy! After opening in 2012, then taking a few years away from Etsy to pursue a wholesale business, I recently returned to my Etsy roots. So, I’m back in my happy place, designing and creating necklaces, bracelets and earrings in my Pennsylvania studio. I love a mix of styles as you'll see-- some minimalist and sleek, some a little boho, each one unique. Enjoy browsing -- I hope you find that perfect piece of jewelry — a present for mom, a gift for a special friend, or a treat for yourself! What a wonderful find! So nice to see turquoise set in gold instead of silver, for a change! Beautiful earrings made to go with the necklace and earrings from this seller. Prompt delivery and communication wonderful! Everything packaged so well too. Love, love, love this bracelet! 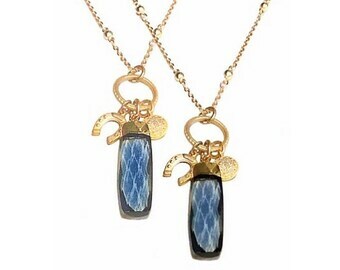 This necklace is very pretty! I look forward to wearing it often. I love this bracelet! This is my second bracelet from this store. I am a return customer. Beautiful necklace! I am very happy with this purchase. 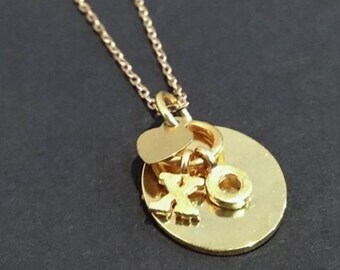 Love this necklace, good quality, excellent service, thank You! 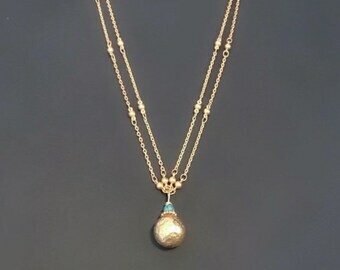 If you love turquoise and gold like I do, I gotcha covered! 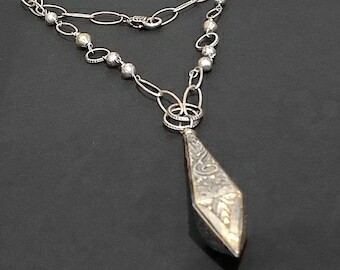 Check out this newbie wrap necklace in the shop. You want a statement piece that can take you from Saturday afternoon to Saturday night? Here it is! This druzy agate bracelet is arm candy that packs a fashion punch! A world to be explored and a compass to guide you. That’s the meaning behind this wanderlust bracelet. Perfect for a recent college grad or your bff who’s starting a new chapter in her life. Off to the Oscars for celebrity gift bags! Motivation is a funny thing. It can come from good times or bad. Mine came from the latter. I was ill for a long time, and when I was able, I honed my jewelry making skills. I had always tinkered with making jewelry and then had time to do so. I purchased supplies and began to experiment. I practiced and designed and practiced some more. 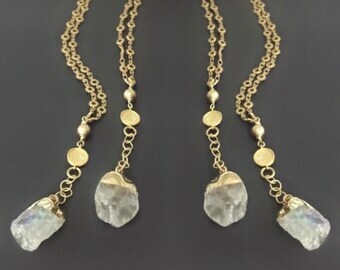 I discovered new stones, unique vintage finds, and beautiful chains and clasps. Opening an Etsy shop became inevitable. Soon after my shop opened, I was contacted by a style influencer from Los Angeles. She found my shop on Etsy and ordered a dozen necklaces for a celebrity mom and baby event she was hosting. It was an incredible business opportunity for me that opened huge doors. 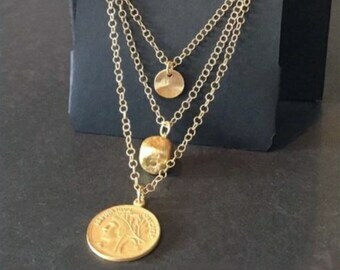 My jewelry was featured in magazines and blogs, it was sold in boutiques around the country, and was included multiple times in Oscar and Emmy swag bags. But oddly, I’d lost many of the things about jewelry making that I loved. I’d gone from designing unique one of a kind pieces, to a wholesale assembly line feel. I had become a business, and less of an artisan. I missed the one on one customer interactions. I missed having time to create and experiment with new ideas. And I did not enjoy the immense pressure. It didn’t feel good and I wasn’t happy. After some soul searching, I decided to return to my home on Etsy. And while I still enjoy wholesaling on a much more limited basis, I now have time to explore my passion for the sake of my creativity, and for my individual Etsy customers. It's a more balanced life. It’s a more creative life. I don’t regret it for a moment! So now, along with my husband, my greatest cheerleader, business advisor, and person who can talk me off the ledge when things get crazy, I continue to create, hunt for fabulous and unique elements and findings, and remain grateful for all of the wonderful customers I’ve met along the way. Thank you for visiting Mack & Jane! I hope you find something you love! To fulfill your order you may provide me with certain information (which you have authorized Etsy to provide to me), such as your name, email address, postal address, payment information, and the details of the product that you’re ordering. You may also choose to provide me with additional personal information (for a custom order, for example), if you contact me directly. For purposes of EU data protection law, I, Jane Makransky, am the data controller of your personal information. If you have any questions or concerns, you may contact me at mackandjanejewelry [!at] gmail.com.